Hi there, everyone! 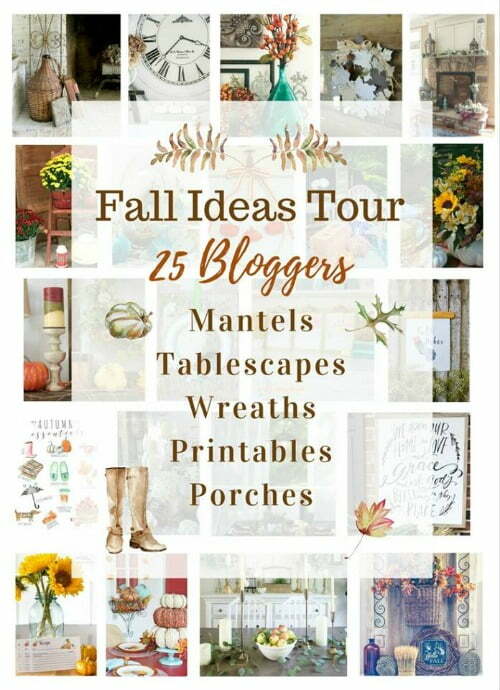 Today I excited to share our Aqua Autumn Porch as part of the Fall Ideas Tour featuring 24 of my incredibly talented blogger friends and little old me! 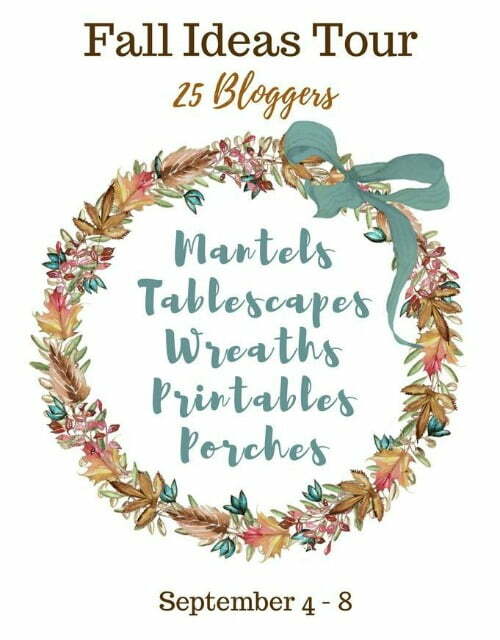 You will find the links to all the other bloggers’ posts at the end of this post, and let me tell you, you simply do not want to miss any of them! 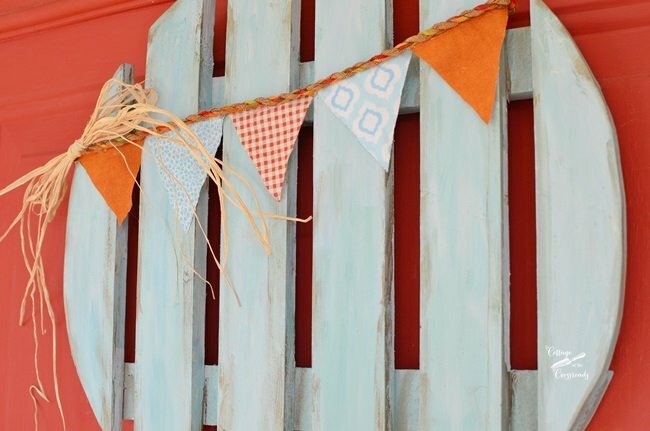 I titled this post “Aqua Autumn Porch” but our porch is decorated with more colors than just aqua! It is surprising how pretty aqua looks with the traditional, warm colors of fall which I have used in abundance on our porch. But aqua is unexpected, and I like to be a little different! If you’re new here, I need to tell you a little bit about our screened porch. It is large and runs across the front of our southern country cottage. 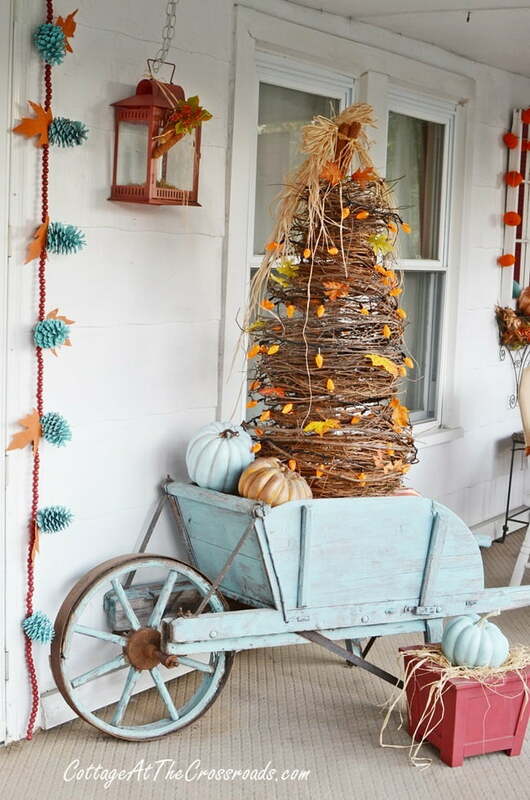 For a while now, we’ve had this old Amish made wheelbarrow on the porch which I decorate around each season. The wheelbarrow is significant because Leo and I have a large garden. In the wheelbarrow is a handmade grapevine tree that I recently made. I had admired one that my Facebook friend Paulette had, and I finally attempted to make my own. 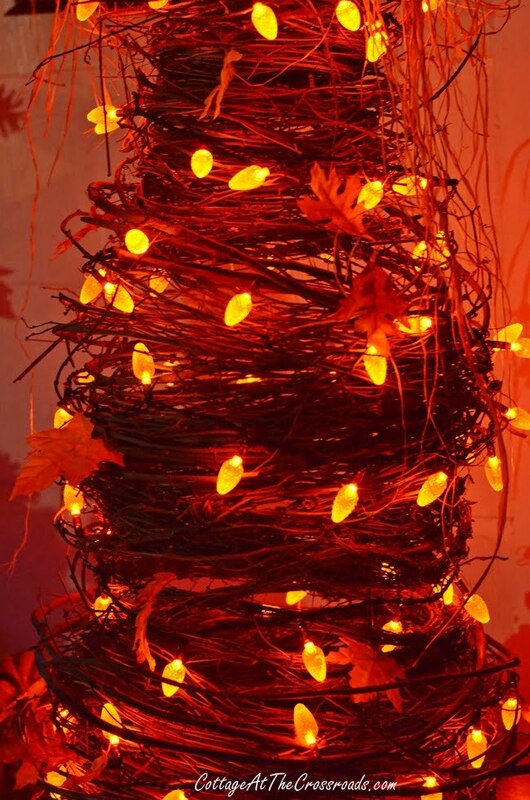 I already had the orange lights in my stash and they look great on the tree during the daytime. But they look glorious at night! Leo and I have enjoyed their warm glow so much while sitting on the porch. Since our porch is large, it is divided into 2 areas. On this end we have a sitting area. 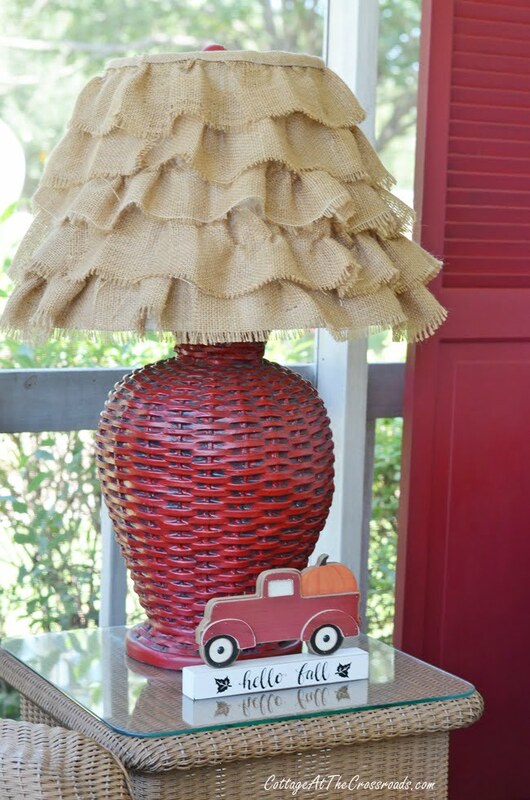 Down here is a red lamp with a ruffled burlap shade that I made several years ago. The little red truck is loaded down with a giant pumpkin! 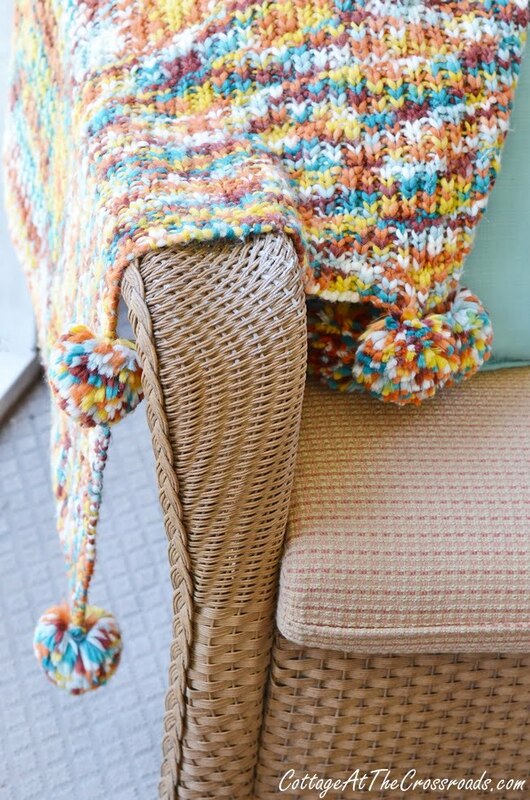 In one chair is a fall pom pom throw that I found and used last year. A new addition is this pillow with the adorable bird on it. We spend our mornings out here on the porch watching and listening to the birds. Henry, our cat, had found a perfect place to snooze! 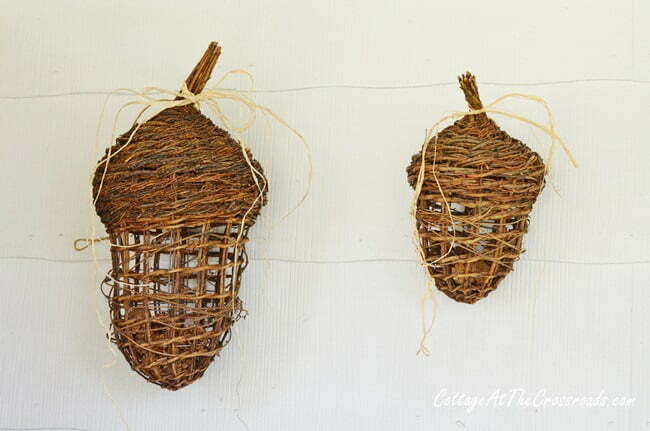 On the wall are 2 giant wicker acorns that my sister-in-law Jean loaned me which add great textural interest. 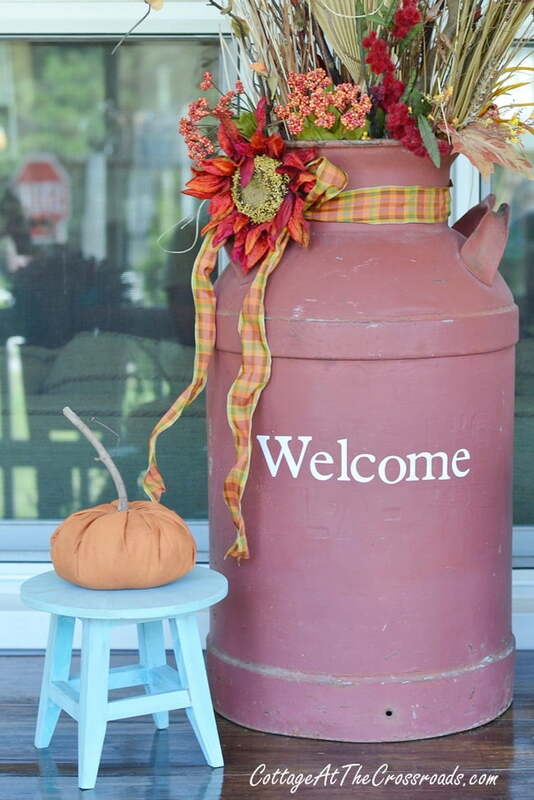 Also on this end is an old milk can dressed for autumn welcoming visitors to the Crossroads. 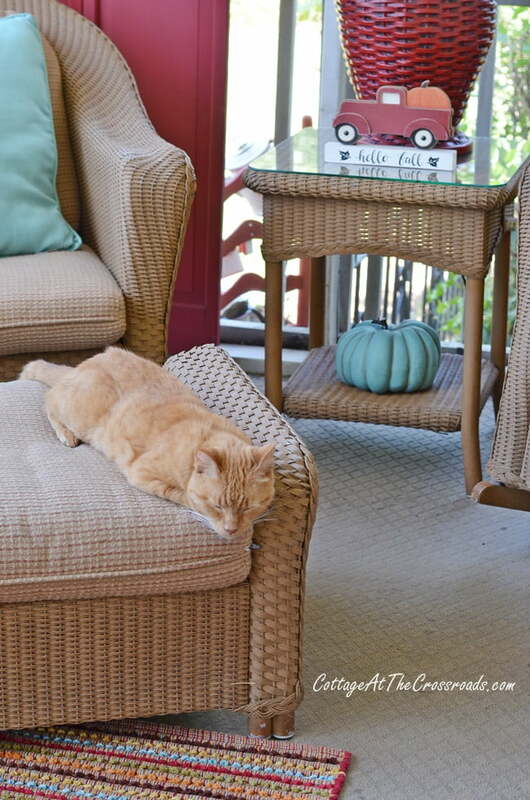 You can tell that I’m a color gal because of the rich autumn colors that I’ve used in decorating the porch! To me, autumn is a celebration of nature’s bounty and the porch is echoing the beautiful, rich colors found in nature at this time of year. The orange pumpkin gets its own pedestal because it’s the first hand sewn one that I’ve made! A grapevine stem stands in for the real thing! There’s an old rocker on this end (can you even imagine a Southern front porch without a rocker???) and you can also see an autumn flag waving on the other side of the screen door. On the left is an antique firkin bucket that I recently painted aqua. 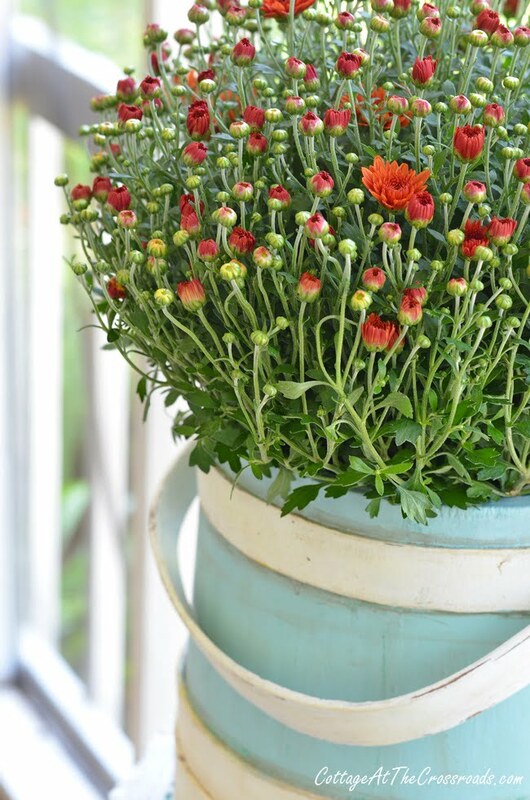 I just love how the rust colored mums look with the aqua! Didn’t I tell ya? At the other end of the porch is our eating area. 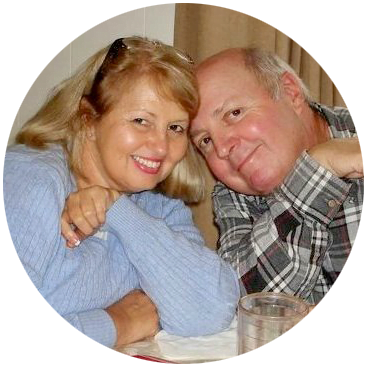 My other sister-in-law Jean (yes, both of them are named Jean!) 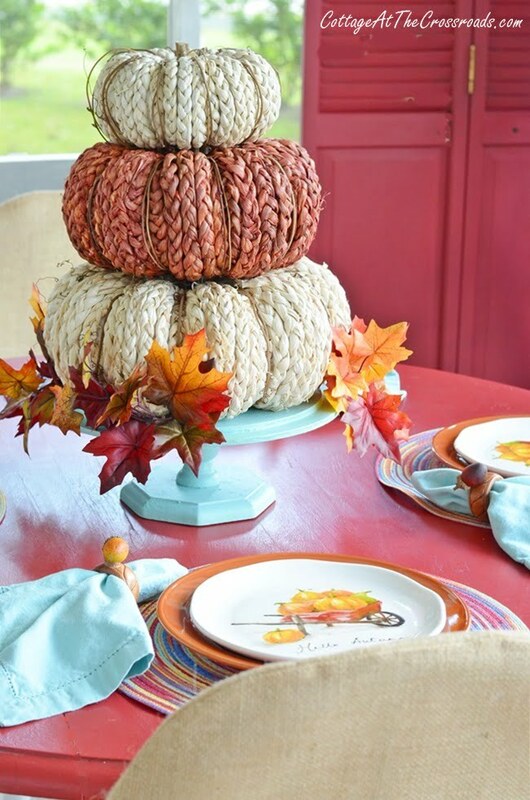 loaned me these braided stacking pumpkins which serve as a centerpiece. I just love their wonderful texture so much that I’m going to have to get some of my own! Well, you just know that when I spotted these plates with the wheelbarrows on them that they had to come home with me, don’t ya? They and the placemats are from Pier 1. 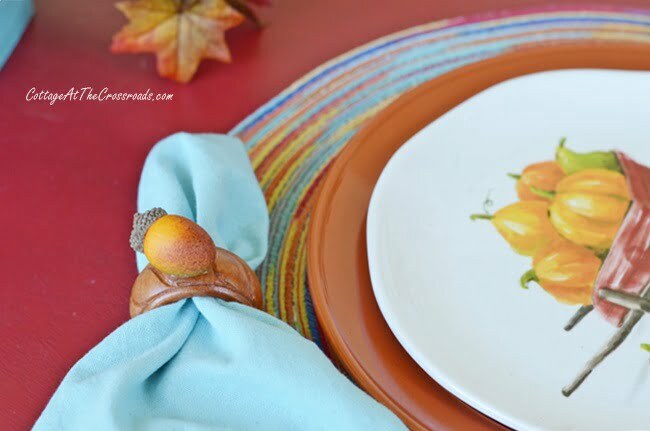 Old wooden napkin rings with acorns hot-glued on them complete the scene. I’m eagerly anticipating enjoying some dinners on the porch on these cool September evenings! I wanted to show you these burlap chair covers. I made them last year when our church was having its tablesetting fundraiser event. 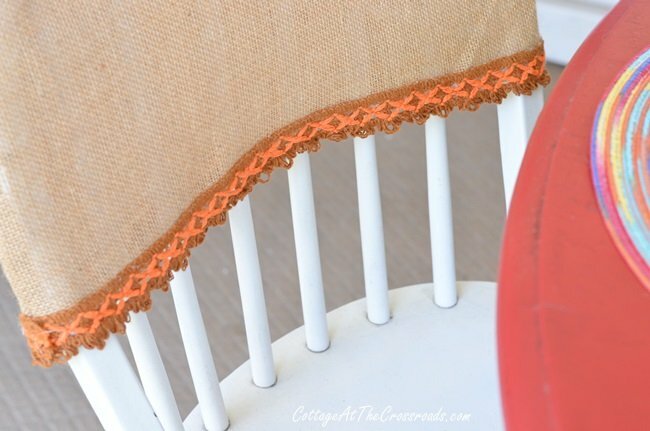 I fully intend to do a tutorial on how to make these because they sure do dress up a chair, don’t you think? Over in the corner is an aqua painted ladder with some topsy turvy buckets on top. I literally just took this from the yard and popped a few faux pumpkins into the buckets. 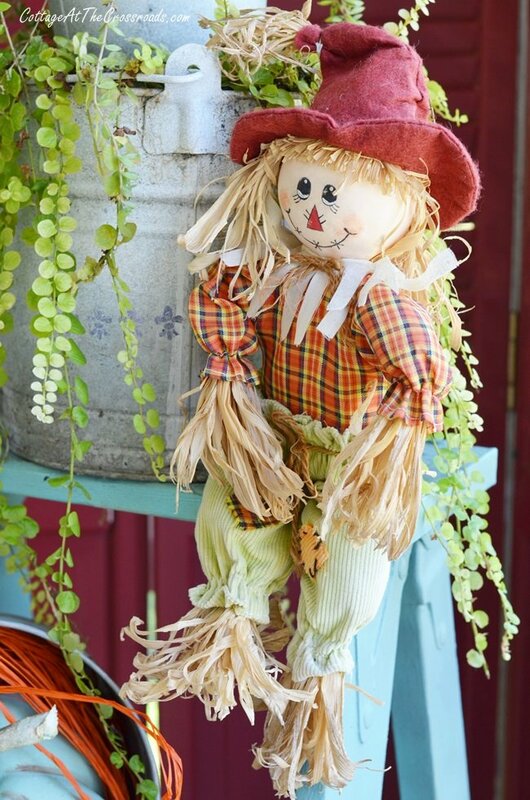 A cute little scarecrow is perched atop the ladder. 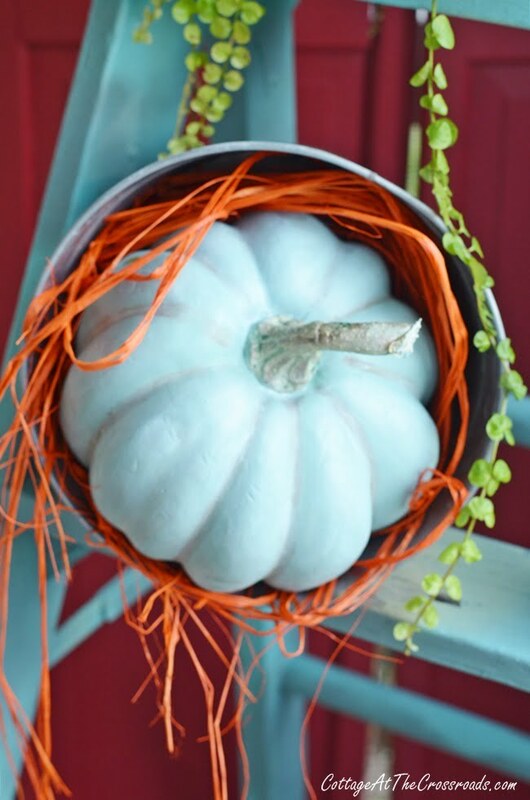 Another bucket holds an aqua painted faux pumpkin. I turned an old wooden plant dolly into a pumpkin shaped fall wreath! More info on how I did that will be coming soon! Henry and I along with the rest of the gang thank you for visiting our Aqua Autumn Porch today. For more inspiration, click on any of the following links to visit my friends on the Fall Ideas Tour. One day, I’m going to show up on your porch and you’re not going to be able to make me leave! But because I’m a southerner, I’ll be sure to bring a hostess gift! Loving your color scheme this year and all the special touches. And you totally taught me something. I had no idea those were called firkin buckets. So pretty, Jane! Love that aqua wheelbarrow! What a cozy and welcoming space! And that tree is SO fun! Love the aqua…. such a beautiful & welcoming space! I love the aqua color with the autumn colors. Very pretty! I LOVE your porch. The colors and all of your special touches make it very inviting. PLEASE do a tutorial for the chair covers, they are so cute and really dress up the chairs. Thank you for sharing and Happy Fall! I so enjoy you! My energy level is somewhat diminished during this life season and it is refreshing to see the creative productivity that is you. You are speaking my language Jane, I love aqua and orange for autumn!! So many wonderful things here! YOu have a porch that dreams are made of! I just love all the things you can do with it and the way you brought in the fall season is beautiful! Oh my goodness, I stared at each picture for like 5 minutes! Everything is so beautiful, fun and festive. I love the color scheme AND you made chair covers too?! That adorable wheel barrow is my favorite part. Wish I lived near you, I’d bring tea and pie and we could sit and chat out there. It’s all so inviting! WOW, so many clever ideas here. I love the burlap ruffed shade and the chair covers. I could sit with that kitty in this porch all day and enjoy myself!! Looks like such a welcoming a comfy area! When I read aqua autumn porch, I KNEW I would love your porch. I love everything you do. Your porch is stunning! 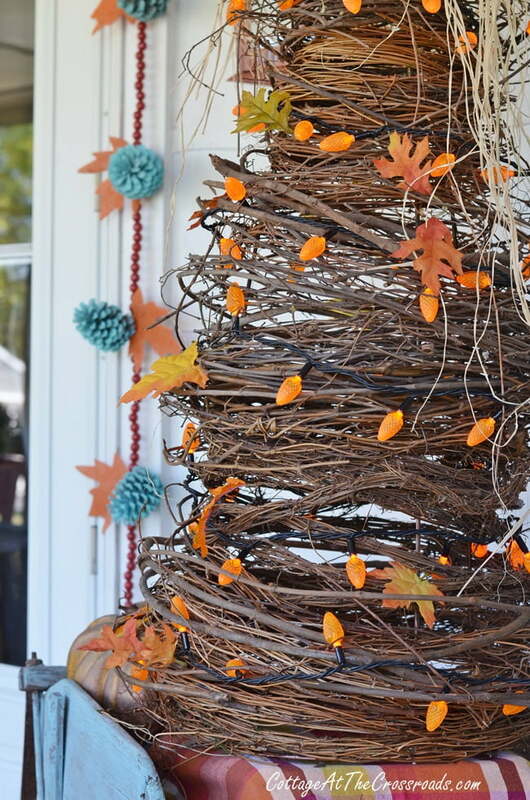 The wreath tree is incredibly beautiful and perfect for Fall. Those lights, too-perfection. I am crushing on the blue wheel-barrel and every detail on your porch. Thanks for sharing bits of your life with us. Happy Fall. I love your decorations!!! You come up with some of the most unique things! And WOW! Your fur baby fits right in to your color scheme– is that planned or just a coincidence????????????? Your porch looks great Jane! 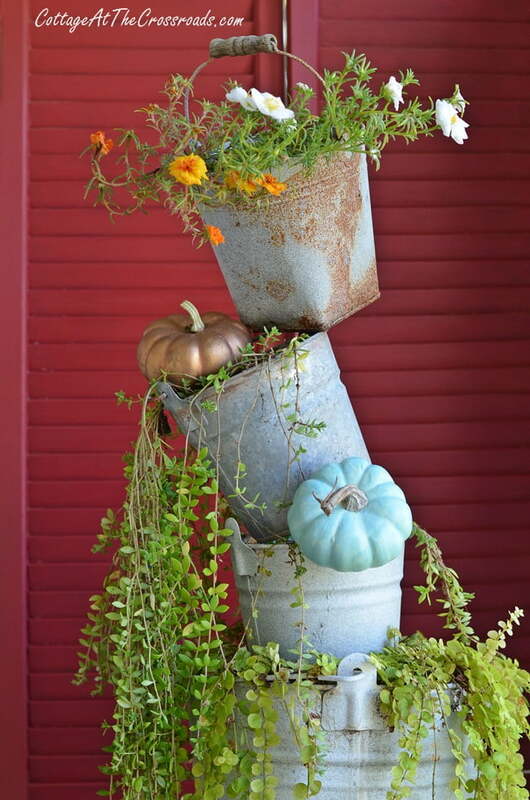 I love the topsy turvy buckets! Wow, I absolutely love it! My favorites are the milk can, the amish wagon, the scarecrow, the aqua, the galvanized buckets… You outdid yourself. I love the aqua touches! I especially love those tall shutters you are using on the porch. That’s a great idea! I always look forward to your posts. So inspiring. Your porch is a postcard for fall. 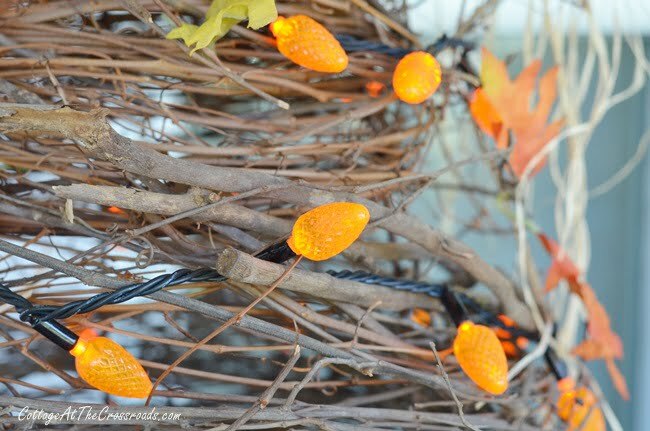 We love the aqua wheelbarrow and your grapevine tree – so clever! 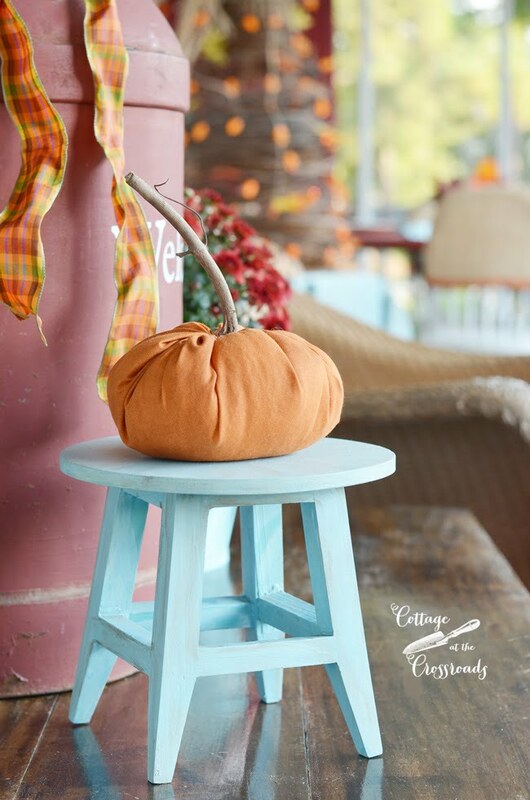 All of your personal touches make your porch the perfect spot to spend fall mornings and evenings. We need to make a reservation for the rocker! Happy Fall! Love it Jane! Praying that Irma is kind to you in SC! I do love aqua with autumn colors and you have styled everything so perfectly. What a cozy place to relax! Love it! The colors are perfect for autumn. I enjoyed the tour and so many cute things on your porch. I love decorating our porches for the seasons. I am a little late this year. Lovely! Can’t think of a more welcoming spot to enjoy a beautiful fall day. Thanks for the share. Your porch is the perfect spot to enjoy our early fall mornings here in SC! I like the addition of aqua to the traditional fall colors – your creativity adds so much! 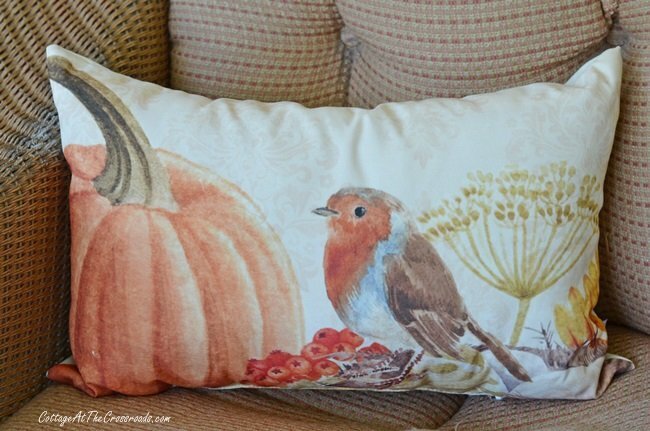 Would like to know where you found the pumpkin with little bird pillow – it is perfect in your chair! 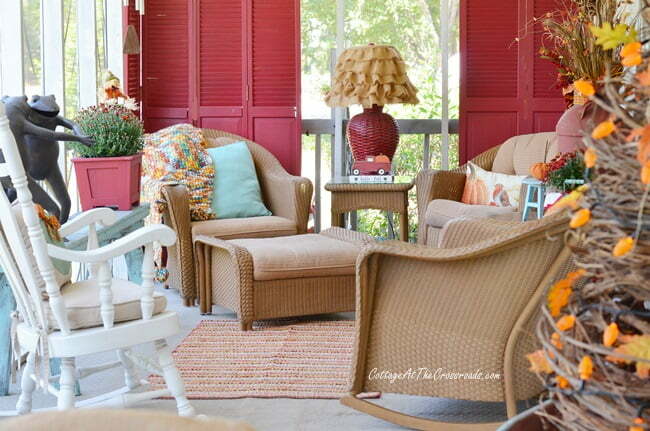 Enjoy your time on the porch! Thank you Karen! I found the bird pillow at Hobby Lobby. 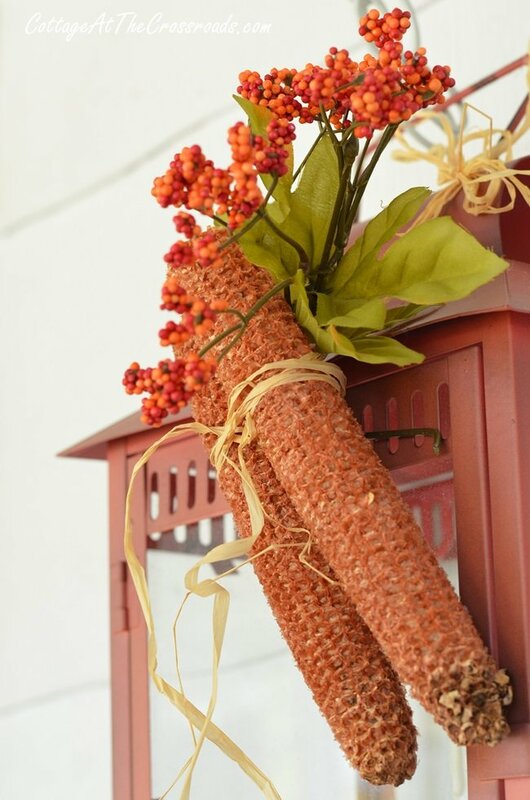 Your porch is decorated to perfection for fall. I so much enjoyed each picture! Henry is a smart cat and knows a good spot to relax when he sees it. You’re right Paula! The pets love the porch as much as we do. 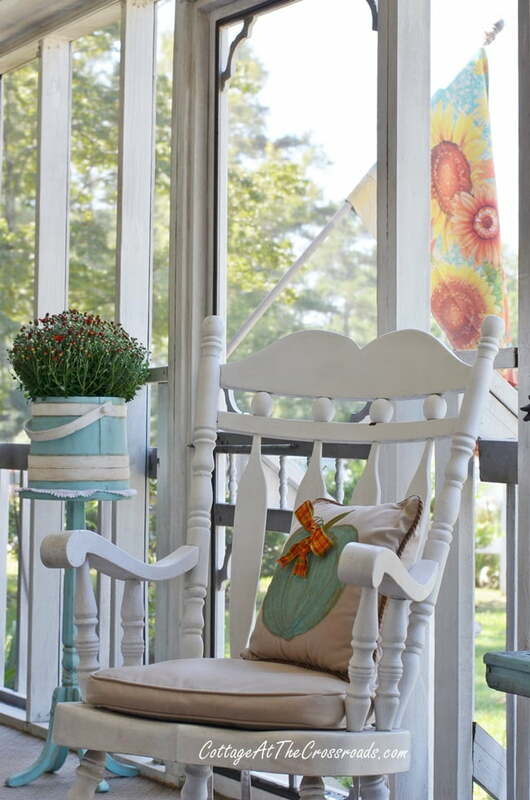 Oh how I always look forward to seeing your porches for each season….it is the perfect Southern porch…I love that it is so large that it is like two rooms. Now if that wonderful wheelbarrow goes missing, I will take the 5th!!! 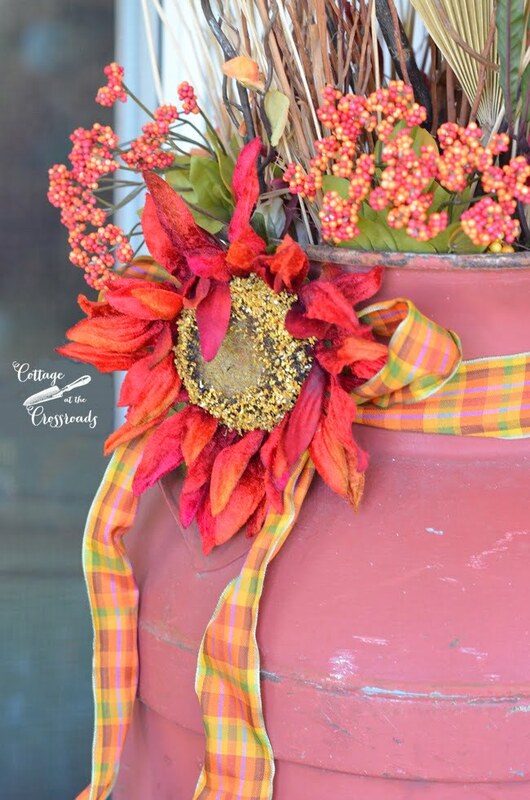 … I am loving the color combinations and your beautiful aqua accents from the pine cones to the amazing firkin bucket! Happy Fall Jane! My regards to sweet Leo too! Can’t wait to see your porches, Shirley! They are always beautifully decorated. 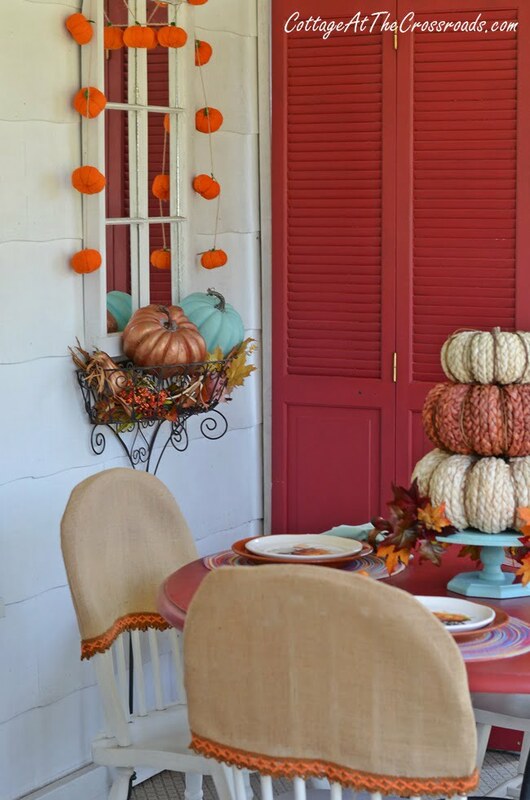 I love all your autumn touches and aqua accents on your porch Jane! 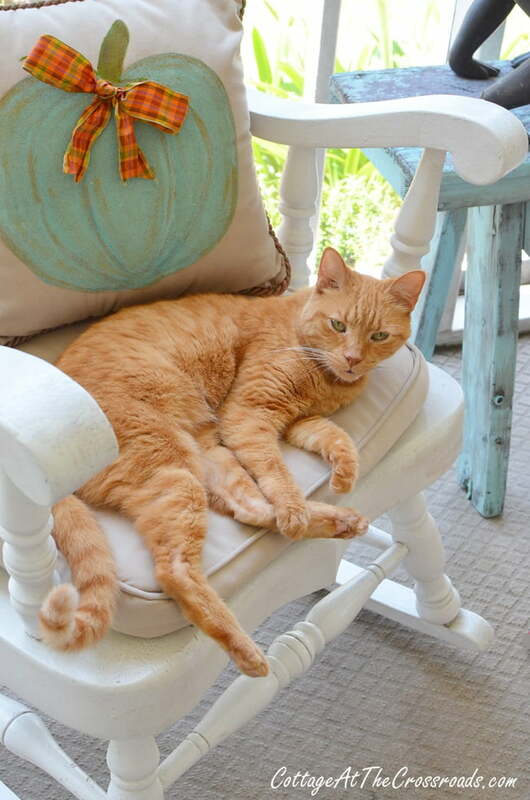 Henry has the right idea and it looks like the perfect spot to sit, eat and enjoy the cool mornings or evenings. 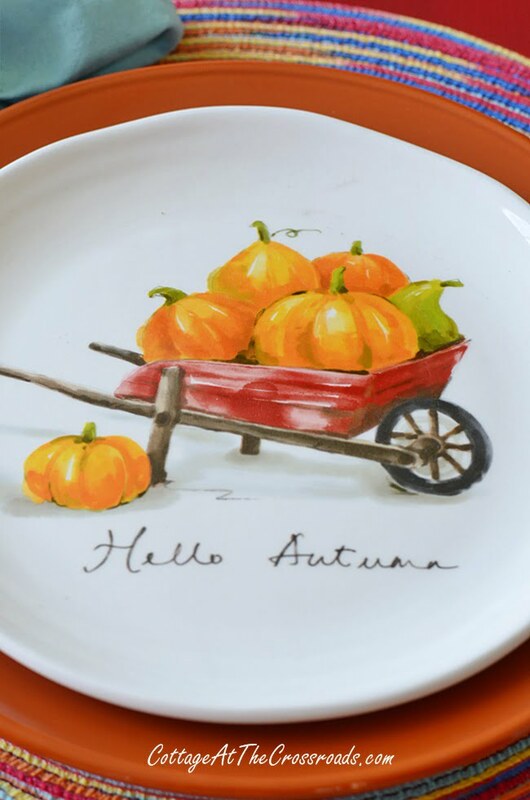 Of course I have wheelbarrow envy and those adorable plates from Pier 1 are perfect for you! P.S. Keeping my fingers crossed that the models and tracking for Irma are wrong and she goes out to the Atlantic. Ya’ll stay safe!